You may have heard that Google have announced a development which means that it is more important than ever to ensure your website is mobile responsive and looks good and works well on mobile devices. It’s called mobile-first index, but what exactly does that mean? First things first, to get a better understand of what mobile-first index is it is important to understand the two SEO terms, crawling and indexing. Crawling is the term used when Google send ‘spiders’ or ‘bots’ to your website for tracking purposes. These spiders or bots crawl your website, follow links to and from your website to get an understanding of the content of your site and discover pages around the web. The process of crawling allows Google to better catalogue or ‘index’ web pages to ensure they are displayed when relevant searches are performed. In the past Google used one index across all platforms, but with the increase in mobile internet searches this is causing a problem for users and affecting the user experience. When a mobile user performed a Google search they would see snippets of desktop pages, but when they clicked through they were frequently directed to a mobile version of the site, which may have contained stripped back content – meaning that the content they were seeing wasn’t relevant to the search they performed. To overcome this Google have developed the mobile-first index, a second index that is purely for mobile users and will display mobile search results when mobile searches are performed. The mobile-first element of the name is because it will now be used as Google’s main index, although the desktop index will still exist. How Does Mobile-First Index Affect your Website? If you already have a responsive website where the layout and design changes to display well on a range of displays and devices then your mobile and desktop rankings will be similar and this latest update will have little effect on your website. However, if you have separate mobile and desktop sites you may have different content on each site, where some pages have been stripped back from your mobile site. 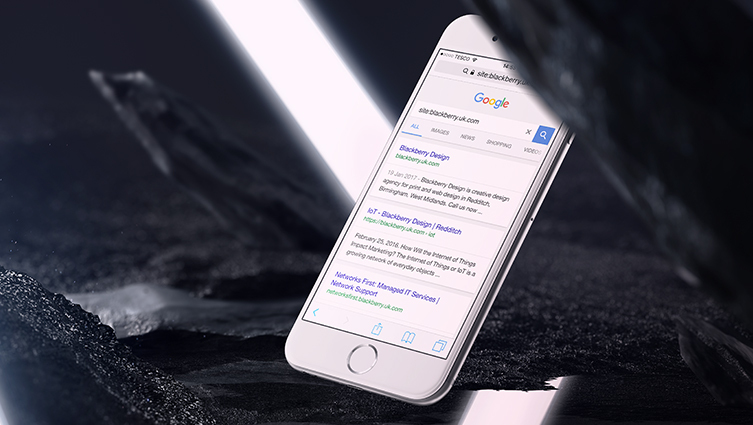 If the mobile spiders cannot find it, it will not appear in the mobile index – which could have an impact on your mobile search rankings. This latest Google update means it’s more important than ever before to have a responsive website that works on mobile and desktop. If you don’t have one or currently have a separate mobile site, it might be time to make a change. Website design is one of our core skills. At Blackberry, we design and build variety of websites for all types of clients. The emphasis is always on clean responsive design optimised for mobile viewing, usability, security and search engine optimisation (SEO).